Not to be confused with Warner Bros's wonderful Footlight Parade, this is an average wartime 20th Century-Fox Betty Grable vehicle, though with a little more humour than most of its ilk. The film contains some very pleasing performances, including a lightly self-mocking one from hulk Victor Mature as a Broadway-bound boxer. Phil Silvers and Jane Wyman are also impressive, but Grable is not at her best, and her leading man is the terminally bland John Payne. This cries out for colour and a decent score, not to mention a more lively director than Gregory Ratoff, who, while not actually getting in the way, doesn't seem to contribute much to the lightweight proceedings. 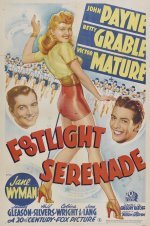 Musical comedy starring John Payne, Betty Grable and Victor Mature. When a boxer lands a Broadway role, he soon becomes attracted to a dancer in the show, unaware that she is married to one of the actors.